This has been such a strange winter. We’ve really only had three snows, and two of them were back before Christmas. We might see a little this weekend, but the past week we’ve had highs in the 60’s! It’s still rather cold in the mornings, so the protocol is: wear a winter coat in the morning and then no coat in the afternoon. ‘It’s supposed to be winter’, winter. Get with the program. 60’s? I’m jealous! Winter here just arrived, and today the high is -4. Of course that is Celsius. Before this week it was just in the low 50’s and very cloudy and rainy every day. That snowman is AWESOME! It looks like a Calvin and Hobbes snowman. Was it made like that, or did it naturally melt that way? Thanks for the link! That was an excellent start to the day! 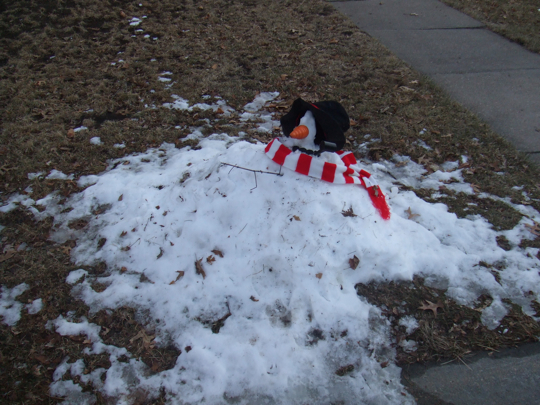 I think they made it out of the pitiful pile of snow that was shoveled from their driveway. The last snow was a week or so ago and it was pretty pathetic. That snowman is hilarious! Reminds me a little of an octopus. And sorry the snow-octopus gets to wear a hat Brad. Is that a plastic carrot for a nose?? ?